Please don’t clean up pesto with your socks! As my toddler looks at me guiltily with green smeared sock in hand, looks back at the floor then happily starts licking the floor. Definitely not how I imagined cooking with my kids. But my second is redefining how I get my kids cooking, finding new ways to make them both excited about cooking (and doing it safely, eek!) is important, just…harder. B has been a bit under the weather this week and I’m trying to find new ways to entice him to take his medicine. Pesto being maybe his favorite food seemed like the perfect intermediary for two different medicine doses. Thai basil seems to be the bigger hit when making and eating pesto with my kids. It’s more fragrant, slightly spicier tasting and goes with EVERYTHING. Yes, I make my pesto with almonds. They are lighter, less expensive and less likely to get stuck up a kids nose. Yup, you read that right. So almonds it is. In a mini cuisinart, add your oil, garlic and almonds. 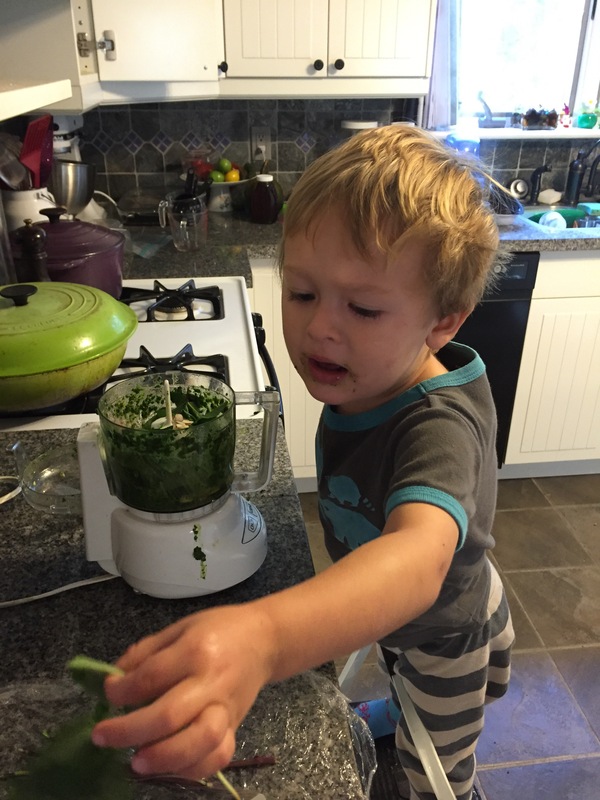 Pulse on chop for 15 seconds then unplug and let your kid (s) de-leaf the basil and add to the cuisinart. Pulse on grind for 15-30 seconds then add lemon juice and salt. Pulse again for about 15 seconds, unplug and taste. If it’s a little dry and grainy looking add more olive oil and pulse until combined. Taste and either serve, or refrigerate for up to a week. Since this is made without dairy you can also freeze for up to 3 months. For individual use servings freeze in an ice cube tray, otherwise we use a freezer friendly mason jar. And now I find myself asking him to stop sticking markers into sockets…sigh.